Jacquard Acid Dyes are concentrated, powdered, hot water dyes that produce the most vibrant possible results on protein fibers including silk, wool, cashmere, alpaca, feathers, and most nylons. Don't be alarmed by the name--the only acid involved is the vinegar that you add. are the most washfast of all dyes for wool. Rich, deep colors. 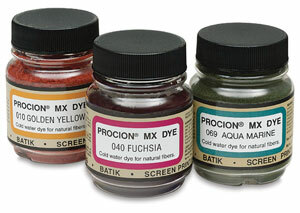 Procion MX dyes are the top choice of hand-dyers working with any sort of plant fiber, as well as silk and soy protein fiber. 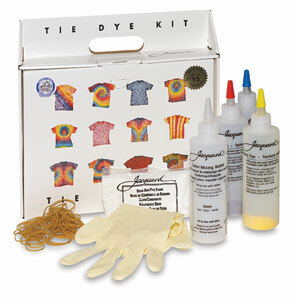 The Jacquard Tie Dye Kit includes excellent Procion MX dyes, plus soda ash, plastic squirt bottles, gloves, and rubber bands - everything you need to get started except for the shirts! See also cotton, rayon, polyester, spandex, nylon, protein, wool, silk, and acrylic. Acetate, also known as rayon acetate, requires the use of disperse dye. (The other type of rayon, which is a cellulose fiber, is also known as viscose rayon.) The manufacturers of Rit all-purpose dye recommend its use on acetate, but results are apt to be uneven and poorly resistant to washing. Aljo Mfg. 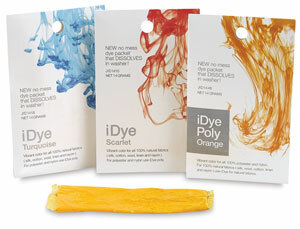 Company, in New York, sells a different range of disperse dyes for use on acetate than on polyester. Abacá is a type of banana grown for its fiber. It is a cellulose fiber which can be dyed like cotton. Chitosan is a fiber obtained from chitin from the shells of shrimps, crabs, or other crustaceans, possibly unsuitable for the shellfish-allergic, in spite of manufacturers' claims. Like cellulose, chitosan is an indigestible carbohydrate, but, unlike most textile fibers, chitosan carries a positive charge, which should make it attract negatively charged dyes. It can be dyed like cotton with fiber reactive dyes or direct dyes. Coir is a cellulose fiber obtained from the inner husk of coconuts. There are two types of coir fiber, brown and white; the color of brown coir makes it unsuitable for dyeing, but white coir is dyed like cotton with fiber reactive dyes. Hemp is a bast fiber which contains cellulose and lignin. It can be dyed like cotton. Ingeo is the trademark for a synthetic fiber, polylactic acid (PLA), made from corn. It is dyed like polyester, using disperse dyes, though it is evidently somewhat less washfast. Jute, the fiber used to make burlap, is a bast fiber which contains cellulose and lignin. It can be dyed like cotton. The usual brownish color will combine with the color of the dye, resulting in relatively dull hues. The presence of lignin can lead to poor lightfastness of dyes on jute. Kapok is a plant fiber whose waxes provide a natural water-repellency that makes it difficult or impossible to dye. Kenaf is a cellulose fiber. It should be possible to dye it like cotton. Silk Latte is a trademark for a fiber spun from milk protein. Like other protein fibers, it can be dyed like real silk, with either acid dyes or fiber reactive dyes. In either case, color is less intense that on real silk. Milkweed seed pods contain a plant fiber whose natural water-repellency makes it difficult or impossible to dye. Nettles produce a fine linen-like fiber which contains cellulose and lignin. It can be dyed like cotton. Pineapple fiber is a cellulose fiber which should be dyed like cotton or rayon. Polypropylene (Herculon, Olefin) is dyed while still in liquid form, before it is extruded into a fiber. It cannot be dyed at home. Ramie is a very strong cellulose fiber, obtained from a plant in the nettle family, which can be dyed like cotton. Sisal is a stiff cellulose fiber from the agave plant. It can be dyed like cotton with fiber reactive dyes or direct dyes. Soy silk is a protein fiber which should be dyed like real silk. Like real silk, and unlike wool, it resists damage from a moderately high pH. it can be dyed with fiber reactive dyes or with acid dyes. In either case, color is less intense that on real silk. Sunbrella® is a high light-resistant brand of acrylic fabric which is solution-dyed before it is extruded into a fiber. It cannot be dyed at home. See Can furniture be dyed successfully?. Nylon objects, such as nylon frisbees, are dyed like nylon textiles. Since spandex is made of polyurethane, follow the same instructions as on the page How to Dye Spandex. Basket reed can be dyed like other cellulose-based plant fibers, using the same dyes that are used for cotton, including fiber reactive dyes, direct dyes, and all-purpose dyes. Since reed contains natural tannins, it used to be common to dye them with the same basic dyes used for acrylic, with the tannins acting as mordants, but basic dyes tend to be more toxic and harder to obtain than direct dyes or fiber reactive dyes. See How can I dye satin or charmeuse?. See How can I tie-dye bean bag toys or other stuffed animals?. Vegetable ivory, from seeds such as tagua nuts, is composed primarily of hemicellulose, a branched-chain polymer whose chains are shorter than those of cellulose. Dye vegetable ivory using the same dyes as other plant fibers, using fiber reactive dyes or direct dyes, or, if it will be sealed with a clear polyurethane finish, dye it like wood (see below). Unfortunately, items with these finishes cannot be dyed. Water-resistant and stain-resistant finishes repel both dye and paint. They cannot be removed by washing. Water resistant finishes may become temporarily less effective when dirty, but this does not enable the material to be dyed. Since wood can be sealed with shellac or polyurethane varnish, it is not necessary to use dyes that bond well to the cellulose and lignin fibers in the wood. This means that both acid dyes and basic dyes can be used, in addition to the direct dyes or fiber reactive dyes that bond well to plant fibers. Woodcrafts suppliers sell metal complex acid dyes for use on wood. The water the dye is dissolved in may raise the grain of the wood, so alcohol-soluble dyes are preferred. Basic dyes can be dissolved in turpentine or Naphtha (white gas) for application to wood, but be wary of the possibility for serious illness caused by using these solvents without excellent ventilation. The mordant potassium dichromate is sold for use in staining wood, but I recommend against its use, due to its high toxicity and ability to cause cancer.